The appointed curator of the 10th Berlin Biennale in 2018, Gabi Ngcobo, speaks about postcolonialism and the importance of revisiting history. As Co-Founder of the now defunct “Center for Historical Reenactments“, CHR (2010–2014), you have been involved in projects that explore different ways of revisiting history and memory, and how language plays a role in these issues. I was interested in knowing more about the importance of history in your work as a curator. Can we actually “rewrite” the past? Who is enabled to write history? During its active years, CHR proposed questions and explored ways in which history can be revisited with old questions asked anew, questions that tended to be more urgent at a certain moment of our recent history. There is a need and responsibility to investigate how historical narratives have been written and constructed – especially when written from positions that glorify those who have historically caused great harm to others and their privileged roles as writers or speakers. CHR gave us a platform from which we insisted and owned the ways in which we understand our own pasts in dialogue with the world, particularly geographic locations and experiences closest to us. There has never been a point when people have not been speaking and/or writing – it is important to take positions outside the grand narratives seriously and consider them as knowledge that we all need to make sense of the world. In a video interview for the Brazilian arts and culture magazine “Bravo!” on the occasion of the 32nd São Paulo Biennale you speak about how to “decolonize ourselves” through a process of unlearning and creating new ways of understanding curatorial practice. Can you give us an example of this? I do think that when speaking about the project of decolonisation we need to be clear that it is a project that sets out to change the order of the world but, to quote from Frantz Fanon, an Afro-Caribbean thought leader, “it cannot come as a result of magical practices nor of natural shock, nor of friendly understanding” (cited from: The Wretched of the Earth). Decolonising means creating new configurations of knowledge and power – and that can be a messy procedure. The curatorial process can be a space to reflect on these processes as well as to pose enabling questions for dealing with a world driven towards misconceived and dangerous wars. Postcolonialism is one of your core research topics. Are you going to focus on these theories for the next Berlin Biennale? I would like to believe that we are all reflecting (or should) on a world that is largely postcolonial. We are all postcolonial... Some contexts are more postcolonial than others. We are still anticipating what it would mean for worlds’ economic powers, such as Germany, to actively admit, acknowledge or engage their postcoloniality – that is, their role in facilitating land dispossessions, brutal regimes that have murdered and dehumanised others for hundred of years. I live in South Africa, in a so-called “post-apartheid society”. I reject this position of the “post” as much as I work with what it means as a definition for me and the work I do as an educator, artist and curator. I reject it because for me and for many people I know, the “post” is only a starting point; it marks or underlines the importance of the thing described as ”post.” It is therefore not a core research topic, but rather an unavoidable position, which I constantly try to shun, just so I can return to it with refreshed eyes. Despite the fact of a focus on the “global contemporary” in the arts, one can consider that the contemporary arts scene is still primarily Eurocentric. Have you ever chosen to reflect on the so-called “global South” or been involved in projects to promote a “South-South” dialogue? I generally try to steer away from labels. Yet I know that not naming and/or claiming one’s point of view has a potential to make room for that very position to be infiltrated by people, institutions and ideas that are only thinking of our subjectivities as metaphors for something else. It is as necessary to guard terms such as “the South” as it is to be vigilant about how they are used to describe and/or discriminate against one. When history is actually happening right in front of you, as it was the case during the past 32nd Bienal de São Paulo in 2016, with Brazil’s president Dilma Rousseff’s impeachment and the subsequent protests against Michel Temer, who took over the official functions: which is the role of the arts in this particular period of time, such as the “now”? Our duty, as creative people, to paraphrase the late Nina Simone, should always be to reflect the times we live in. We do this also by challenging constructions of history that have and continue to favour the powerful as we fight for the future we want to see and experience in the world, beyond our own physical existences. In this sense, how do you understand your role as a curator for the next Berlin Biennale in the current German sociopolitical context, with the arrival of a large number of refugees and the rise of right-wing political parties? As mentioned above, I believe it is imperative for a platform such as a biennale to take into cognisance urgent sociopolitical contexts of places from which they are staged as well as historical narratives that have shaped a place in relationship to the rest of the world. 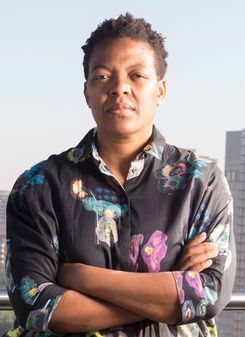 Gabi Ngcobo, curator 10th Berlin Biennale for Contemporary Art | Photo: Masimba Sasa Since the early 2000s Gabi Ngcobo (1974) has been engaged in collaborative artistic, curatorial, and educational projects in South Africa and on an international scope. She is a founding member of the Johannesburg based collaborative platforms NGO – Nothing Gets Organised and Center for Historical Reenactments (CHR, 2010–14). Recently, Ngcobo co-curated the 32nd Bienal de São Paulo (2016), which took place at the Ciccillo Matarazzo Pavilion in São Paulo and A Labour of Love (2015) at Weltkulturen Museum in Frankfurt am Main. In Cape Town she has worked at the Iziko South African National Gallery and at the Cape Africa Platform where she co-curated the Cape07 Biennale in 2007. Since 2011 she has been teaching at the Wits School of Arts, University of Witwatersrand in South Africa. 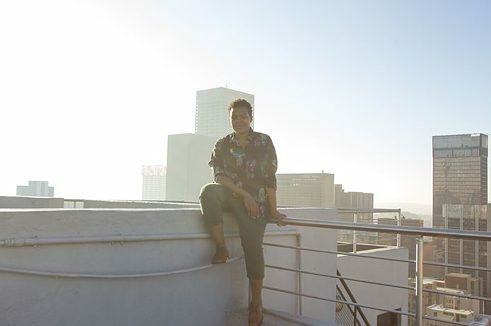 She currently lives and works in Johannesburg and will move to Berlin for the preparations of the 10th Berlin Biennale. Katerina Valdivia Bruch conducted the interview. She is a Berlin-based freelance curator, author and art critic. Copyright: Goethe-Institut, Katerina Valdivia Bruch. This work is licensed under a Creative Commons Attribution – Share Alike 3.0 Germany license.